How do volcanos produce lightning? Scientists are using technology that can peer inside a volcano’s ash plume to understand how volcanic lightning is formed. Lightning during a thunderstorm can be dramatic, but lightning over an erupting volcano may just be one of nature’s most stunning phenomena. Scientists are only now beginning to understand the intricacies involved in the production of volcanic lightning thanks to the development of new electromagnetic wave technology that can peer inside an ash plume. 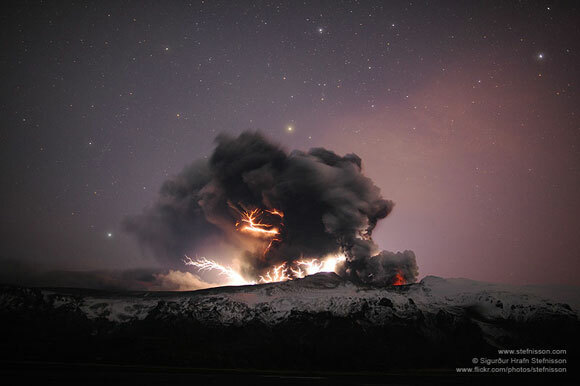 Volcanic lightning under the starry sky at Eyjafjallajokull in Iceland during a 2010 eruption. Image appears courtesy of Sigurdur Stefnisson. 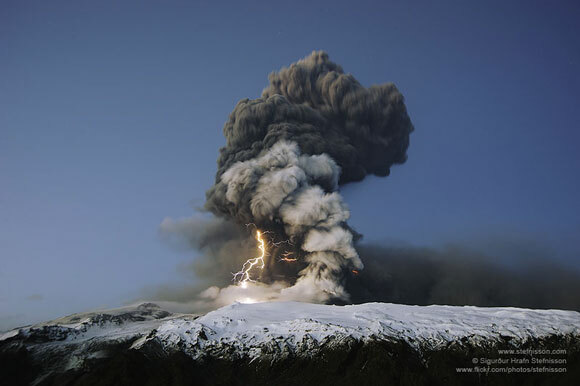 Volcanic lightning above Eyjafjallajokull in Iceland during a 2010 eruption. Image appears courtesy of Sigurdur Stefnisson. Lightning is generally caused by the separation of positively and negatively charged particles in the atmosphere. Once the charge separation becomes large enough to overcome the insulating properties of air, electricity will flow in between the positively and negatively charged particles as bolts of lightning and neutralize the charge. In storm clouds, the charged particles originate from liquid and frozen drops of water circulating within the clouds. Lightning occurs within a storm cloud as the positive particles accumulate near the top of the cloud and the negative particles gather below. 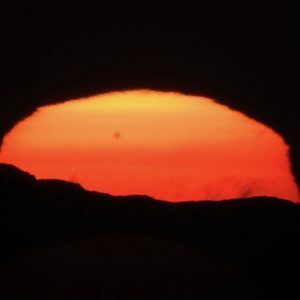 Negative charges on the underside of a storm cloud are also capable of connecting with positive charges on the ground creating cloud-to-ground lightning. Thousands of lightning flashes have been observed over large volcanic eruptions. Scientists think that the charged particles responsible for volcanic lightning may originate from both the material ejected from the volcano and through charge formation processes within ash clouds moving through the atmosphere. However, only a few scientific studies have been conducted on volcanic lightning to date. Hence, the exact cause of volcanic lightning is still being actively debated. Volcanic lightning is difficult to study not only because of the remote location of many volcanoes and infrequent eruptions, but also because dense clouds of ash can obscure lightening flashes. New technology involving very high frequency (VHF) radio emissions and other types of electromagnetic waves is now allowing scientists to observe the lightning inside of ash plumes that would otherwise not be visible. This technology was first deployed during a 2006 eruption at Mount Augustine in Alaska, and it was later used during eruptions at Alaska’s Mount Redoubt in 2009 and Iceland’s Mount Eyjafjallajökull in 2010. From these studies, scientists have been able to distinguish two different phases for the production of volcanic lightning. The first phase, known as the eruptive phase, represents the intense lightning that forms immediately or soon after the eruption near the crater. This type of lightning is thought to be caused by positively charged particles ejected from the volcano. The second phase, known as the plume phase, represents the lightning that forms in the ash plume at locations downwind of the crater. While the origin of the charged particles for plume lightning is still being investigated, some sort of charging process within the plume may be taking place given that there is a bit of delay in the production of such lightning. Further studies will surely follow. Bottom line: Intense and spectacular lightning storms can be produced during large volcanic eruptions. Scientists think that the charged particles responsible for volcanic lightning may originate from both the material ejected from the volcano and through charge formation processes within ash clouds moving through the atmosphere.